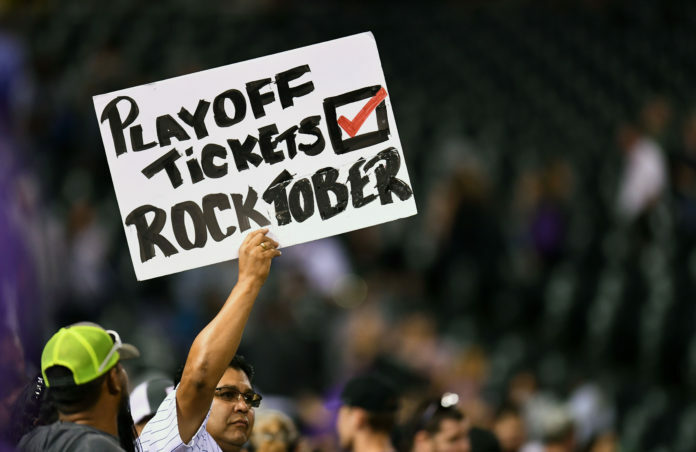 Denver may be a football town, but 2018 is the Year of the Colorado Rockies. The 2018 NFL season officially kicks off tonight with the Philadelphia Eagles hosting the Atlanta Falcons on Thursday Night Football. The rest of the league, including the Denver Broncos will obviously begin their respective seasons on Sunday or Monday night. Denver has without question, always been a football town that bleeds orange and blue. When the Broncos are doing well, the city genuinely comes to life and it does phenomenal things for the local economy. Here is the thing though — the Rockies are currently leading the NL West by 1.5 games — and in nearly two decades of following the teams in this city, I can confidently say this is one of the most exciting Denver teams of all-time. So, while Broncos Stadium at Mile High will be rocking for Week 1 on Sunday, the Mile High City should be painted purple over the next month. Now, before the local football fans show up at my door with pitchforks, let me provide a few examples of how exciting this baseball season has already been and provide a little more context to this statement. 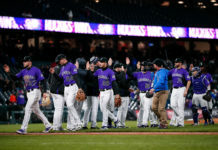 In Wednesday night’s victory to complete the sweep over San Francisco, shortstop Trevor Story launched three home runs, including the longest in the history of Coors Field (505 feet). Here is Trevor Story hitting a baseball 505 feet. Enjoy ? In 138 games this season, Story has a career-best batting average of .298 and leads all MLB shortstops with 31 home runs. The third-year shortstop has 39 doubles, which is tied for the NL lead. And when the 2018 season comes to a close, Story will likely be part of the 30-30 club as he currently has 25 stolen bases. Story is genuinely having an MVP-caliber season and the craziest part is he gets overshadowed because of the amazing things Nolan Arenado does on a nightly basis at third base. On the other side of the infield, D.J. LeMahieu has a career-high 14 home runs, despite missing more games to injury than he has in his entire career. And Ian Desmond casually leads the National League in RBI against the division. 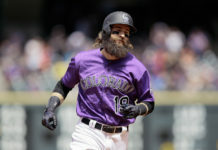 In the outfield, the Rockies have Charlie Blackmon, who needs no explanation. They also have a pair of Denver sports icons with both Matt Holliday and Carlos Gonzalez on the roster. In the year 2018, there is actually potential for these two to go yard in the same game. As someone that watched every inning of the 2007 World Series run and 2009 playoff appearance, the thought of seeing these two play meaningful baseball together in this city over a decade later gives me goosebumps. If the nostalgia angle does not do it for you, then maybe 40 comeback victories will ignite your interest. On a nightly basis this team is a rollercoaster of emotions in the best way possible. This differs drastically from the disappointing ride of pain and misery that the Broncos have put the local fans through since winning Super Bowl 50. 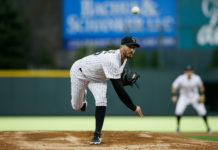 I understand there is reason for optimism regarding the Broncos’ success this season, but trust me when I say that the Broncos will not do anything in the first half of the season that is nearly as exciting as what the Rockies do each night at 20th and Blake. This may be a football town, but 2018 is the Year of the Rockies.